Controversial plans for a new surface mine between Cossall and Trowell has been signed off. The proposals for Shortwood Farm were revealed in 1990 and developers and campaigners have been in dispute ever since. The planning permission gives consent for UK Coal to extract an estimated 1.275 million tonnes of coal and 250,000 tonnes of fireclay from the Shortwood site. The surface mine will create 56 jobs. Uk Coal submitted plans to Nottinghamshire County Council in 2012 with planning consent signed off on June 11. However Broxtowe MP Ann Soubry said: Anna said she felt it was a pity that Nottinghamshire County Council had given final agreement to the opencast mine without sorting out problems with the route first. She said: “At its peak, there will be 68 HGVs leaving and exiting the site every day and this will cause real disruption to already heavily congested local roads. Sally Gill, head of planning at Nottinghamshire County Council, said: “The preparation, determination and completion of the Shortwood surface mine application has been an extremely complex and challenging process. “Throughout the process, officers and members have had to weigh up the benefits of the scheme alongside the potential for disruption and objections from the local community. “The decision by the planning and licensing committee to grant planning permission, subject to the legal agreement, was endorsed by the Secretary of State for Communities and Local Government, who opted not to call the application in. 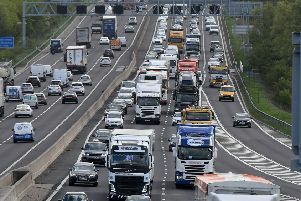 The county council said a campaign was on-going to allow heavy goods vehicles serving the new surface mine to get direct access to the M1 through the adjacent Trowell Services.